Motsamot blends total peace, seclusion and natural forest surroundings with Thai tradition and luxury. All that's missing is the beach. 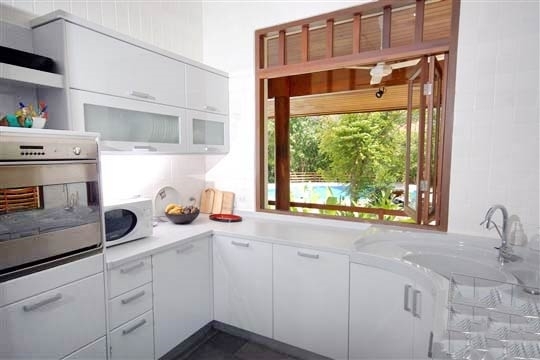 But then this is reflected in the attractive rental rate, and there’s plenty of white sand to enjoy just down the road at Choeng Mon beach, plus a pleasant free-form pool (20m) to splash about in at the villa. Motsamot's mirror-image pavilions make it an appealing choice for groups or families sharing. It may not be the ideal villa for toddlers thanks to the proliferation steps and unguarded water features, but for older kids (10+) it's a treasure trove of fun with endless places to explore. Two spacious living and dining areas allow plenty of choice for indoor relaxation. 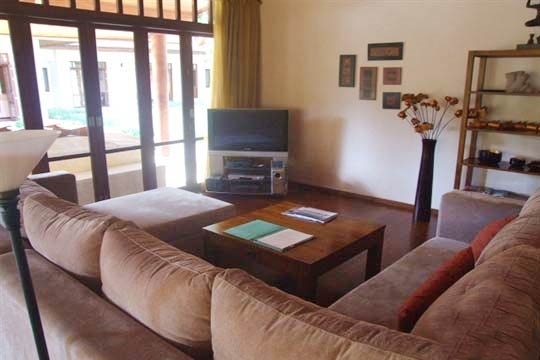 Although both are pleasantly furnished, the lounge in the right-hand pavilion feels a little less formal and makes a comfortable daytime base, while the one in the left-hand pavilion is ideal for evening meals and post dinner movies. Outdoors, the chill-out choice is easy: poolside loungers for sun worship or the impressive, stage-like sala (gazebo) for refreshments and shade. Even when fully occupied, you'll never be short of a secluded spot to retreat to at Motsamot, and the quiet, leafy surroundings and water features create a private and relaxing atmosphere. The villa’s layout also makes it a fabulous choice for a small wedding, with respective families happily occupying their own pavilion, before coming together to celebrate around the pool. Our initial concern at the location soon gave way to satisfied sighs when we settled into Motsamot's appealing, natural surroundings. The serene forested setting and abundance of space more than compensated for the lack of beach or ocean views, and with 20m of cool blue pool to swim and splash around in we never felt an overpowering urge to get sand between our toes. The villa's intriguing design touches and framed photographs of Asia not only make it feel homely, but also had us pointing out details to each other; playing 'guess the country of origin' as we admired the owner's well-travelled taste. It's hard to confine yourself to one spot at Motsamot and we definitely wished we'd come as a group to make the most of all the different lounging, dining and bathing options. The staff happily but unobtrusively followed us around, bringing us cool drinks as we switched from pool to sala to lounge and finally to the terrace. They even moved the furniture outside for us when we decided the latter was the best place to relax with a book. Having a rental car meant both Choeng Mon and Chaweng were an easy hop for dinner by the sea. During the day we survived on the filling breakfast (included) and then snacks we bought at the local minimart. Not a choice for seasoned beach freaks perhaps, but certainly a very comfortable and original villa if, like us, you like a bit of privacy, plus the freedom to come and go with ease. 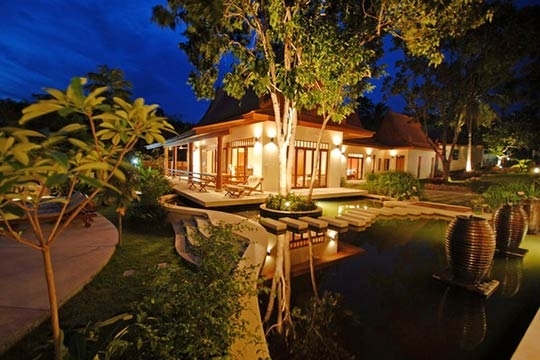 Motsamot’s peaceful and private forest setting is unusual on an island famed for its beaches; so unless you can't live without sea views, this villa offers an attractive alternative, away from the tourist crowds. Pool access from the pavilions, via steps and stepping stones across the pond, is a little difficult (especially with toddlers), but basing yourself at the poolside sala means you don't have to negotiate this route too often. There is occasional construction noise from the nearby development but it rarely disturbs the peace. Motsamot is located towards the end of a small lane around two kilometres from Choeng Mon village and its popular beach. There's nothing of significance close by as Motsamot sits in an undeveloped forested area. (During our inspection in March 2010 a large residential development was under construction a little further up the hill, which might cause occasional disturbance). Although the villa is not far from the sea, the nearest bit of coast is inaccessible as it’s down a steep cliff and surrounded by coastal forest (the nearest swimmable beach is at Choeng Mon). There's a 7-Eleven store on the main road into the village and a handful of local restaurants nearby, but for wider food and shopping choices you have to drive into Chaweng (4km). Motsamot is basically two grand villas in one. From the wide car park at the entrance steps lead down through landscaped gardens to two Thai-style pavilions that sit either side of a carp-filled lily pond. Each pavilion (one left, one right) houses spacious, wood-floored, fan-cooled living and dining areas; both opening out onto wide, covered, terraces. Inside, generous sofas are poised in front of 38-inch flat-screen satellite channel TVs with DVD players and music systems. 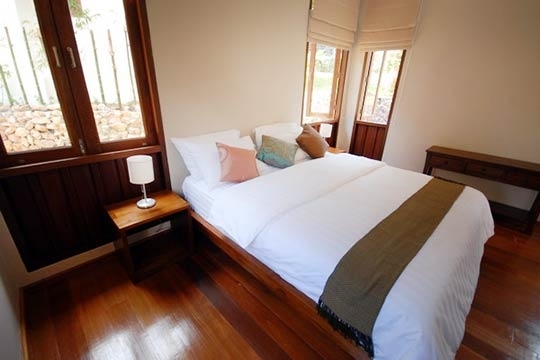 Each room also has an eight-seater teakwood dining table, served by a modern, fully equipped kitchen. Asian ornaments, photographs and artwork add a strong sense of tradition. The opulent master suite is in the left-hand pavilion, reached via a small study (could also work as an additional bedroom for an older child). The wide king-bedded master has floor-to-ceiling windows on two sides (one side opening onto a private garden-view terrace), plus flat-screen TV with DVD and satellite, walk-in wardrobe, private dressing room and a generous ensuite bathroom with a large tub and rain shower. 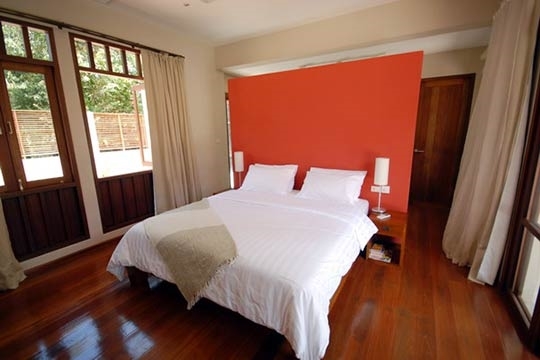 At the opposite end of the living area, overlooking the pool, there's a very private and comfortable king-bedded guest bedroom (no TV) with ensuite shower. The right- hand pavilion houses three more bedrooms. 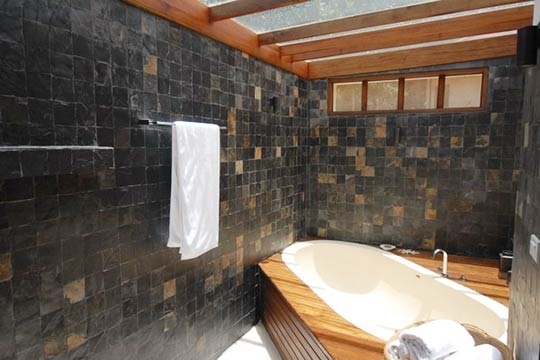 The second master suite is smaller than its neighbour, but boasts a spacious semi-outdoor (covered) bathroom with tub. This room is also king-bedded and features a flat-screen TV with DVD and satellite. 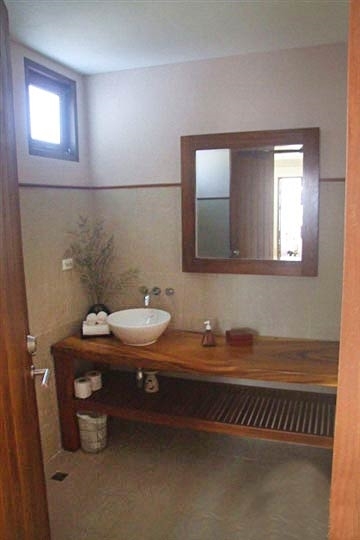 Behind that, there's a modest single room with ensuite shower while, at the back of the pavilion, another more modest, king-bedded guest room overlooks the gardens and has a rain shower ensuite. 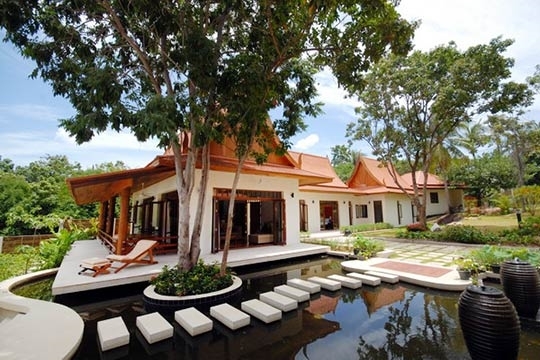 A 20m, freeform pool occupies the lower grounds, with a Thai style sala at one end, and an outdoor shower, plus umbrellas and comfortable sun loungers placed around the pool’s edge. Boulders, mature trees and colourful tropical plants fill the gardens beyond the pool, a naturally shaded area that children will love to explore. Lower rates are also available when 3 bedrooms (1 pavilion) or 4 bedrooms will be used. Contact Customer Service for details. 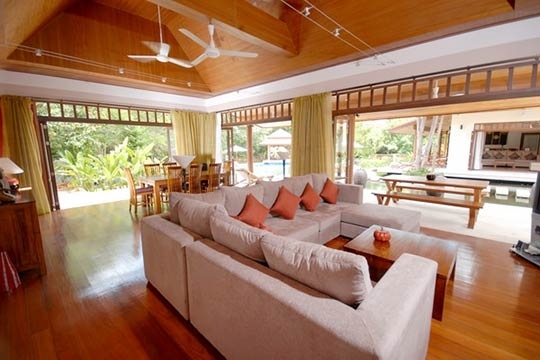 5 bedroom villa located in Choeng Mon, Koh Samui. Ideal for Beach in ten, Body and soul, Bring the relatives, Kid friendly, Gastronomic delights, Fair share for groups, The great outdoors, Party pads, Sensible for seniors, Perfect for weddings.